HEART PALPITATIONS: WHY DO I FEEL MY HEART BEATING? Stress and anxiety can manifest themselves in many different ways, affecting both our mental and physical health. This week, at London Doctors Clinic, we are focusing on stress, as part of stress awareness month, and in this article we will be discussing heart palpitations. This is the term given to the sensation of your heartbeat becoming more noticeable. Most of us don’t notice our heart beating in our day to day life unless we are nervous or excited, but if you experience this sensation at other times, this is often referred to as having ‘palpitations‘. How Do I Know If I’m Having Palpitations? You may feel like your heart is beating harder than normal, fluttering or even beating irregularly, and this unusual sensation may last for just a few seconds or up to a few minutes. Some people have these feelings in the neck or throat too. Some people might feel like their heart has an extra beat or even missed a beat. These are known as ‘ectopic beats‘. Heart palpitations can be due to lifestyle triggers, emotional factors, medications, hormone changes, heart rhythm problems, heart problems or other medical problems. If you find yourself experiencing palpitations after any of the above events, and you believe this activity triggered the palpitation, then you should should try and avoid this activity again in future, to prevent further palpitations. Excitement, nervousness, stress or anxiety can all cause palpitations, but these feelings should pass when you feel calmer. Some people may get palpitations together with panic attacks. Panic attacks involve an overwhelming sense of anxiety or fear together with feeling sick, sweating, trembling and palpitations. If you are experiencing these symptoms, there are breathing exercises and other tips that might help you. If you think a certain medication may be causing your palpitations, your doctor may suggest slowly lowering the dose, stopping the medication, or changing it for another similar medication that should not have this effect. Do not make changes to your medication regimen without first consulting a doctor. In women in particular, heart palpitations can coincide with a woman’s periods, with pregnancy or with the menopause. These may be harmless, but it’s always important to speak to a doctor about this just in case, especially if you experience palpitations while pregnant. Atrial fibrillation (AFib) is a relatively common condition that can cause a fast irregular heart beat. This is particularly common in young people who are often otherwise healthy. They may experience episodes of fast but regular heart rate. A more serious problem involving a fast regular, heart rate which may also involve dizziness or blackouts. Problems with the heart valves, heart failure or other rarer conditions such as cardiomyopathies (abnormalities of the heart muscle) can also cause palpitations. These conditions are often serious and usually require treatment. First of all, if you’re at all concerned about these palpitations, it’s always better to be on the safe side and speak to a doctor about them. If they’re caused by anxiety, not seeing a doctor will lead to more anxiety, further exacerbating the problem! If you have any of these above mentioned symptoms in addition to palpitations, this could suggest you have a very serious and possibly life-threatening heart problem that needs to be checked by a doctor as soon as possible. 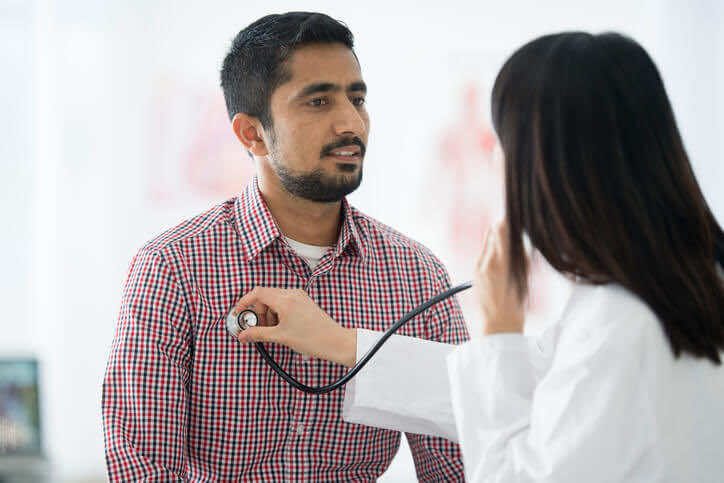 If you would like to speak to a doctor about any of the topics mentioned in this article, from palpitations and heart conditions, to stress and anxiety, you can find us at any of our 9 central London clinics! Book in today, for peace of mind.